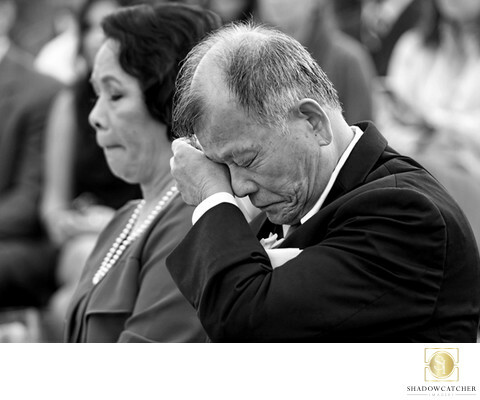 Emotions are always right there at weddings. It's an emotional day for everyone who loves the couple. But for parents, it's especially emotional. Their babies are growing up, time is passing and much that they've lived for up to now is coming together. This father just got a little overwhelmed as his daughter said her "I do's." We shoot with long lenses during the ceremony so that we don't intrude on those moments that are so important to capture. This was shot with a Canon 70-200 f2.8L IS. This the third focal length lens every wedding photographer should have in his bag. If you work with zooms, a 16-35, a 24-70 and a 70-200 are the trinity of lenses that cover 99.99% of everything a wedding photographer needs. Fast zooms are critical, too, not just that f2.8 and faster are good for low light or setting blurred backgrounds, but this aperture in a single aperture lens is usually the best that any manufacturer makes in those focal lengths. These lenses also pair up nicely with the best bodies that those manufacturers make, too.